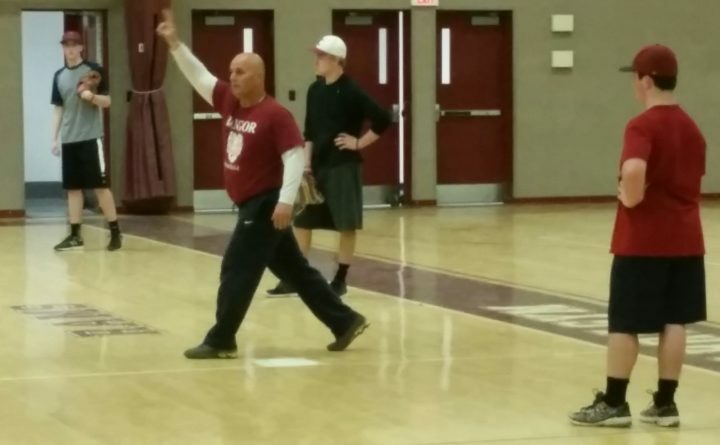 In this 2015 file photo, Bangor High School then-assistant baseball coach Dave Morris instructs pitchers and catchers during a spring practice. Morris was named the new Bangor football coach Wednesday, April 25, 2018. Bangor High is turning to a familiar face in an effort to rebuild its tradition-laden football program with the school committee’s approval Wednesday evening of Dave Morris as the Rams’ new head coach. Morris, a 1985 BHS graduate, replaces Alan Mosca, who opted not to pursue a fourth season as head coach after the Rams struggled to a 3-23 record over the past three years — including 0-8 marks in 2016 and 2017. “There’s such a great tradition here and I have a lot of strong ties to it in terms of loving Bangor,” said Morris of a program that has won five Class A state championships since 1950, the most recent in 2001. Morris already is the school’s varsity baseball coach and led that team to its fourth consecutive Class A state championship last spring. He also guided the Queen City’s American Legion baseball program to its third state championship in the last four years last summer. “Coach Morris represents everything good about what high school athletics strives to achieve,” said Bangor athletic administrator Steve Vanidestine. “He gives back more in every relationship he has with the players than he expects to receive and he’s an outstanding role model who helps players understand that helping others get better is one of the the most important tests of building a good team. Morris, who played strong safety and running back at Bangor under current Husson University coach Gabby Price from 1982 through 1984, has been head coach of the city’s eighth-grade football team for the last two seasons after spending the 2015 campaign on Mosca’s high school coaching staff. Morris also was an assistant under former Bangor head coach Mark Hackett in 2009 and 2010, the last two times the Rams captured the Eastern Maine Class A championship. He also coached freshman football at Brewer High School for three years after beginning his football coaching career as a Bangor High School assistant from 1989 to 1993. Morris said that taking the varsity football job will not affect his baseball coaching duties. “It’s real easy to look at this from the perspective that I’m coaching two sports,” said Morris. “But I don’t coach baseball by myself. I have some great assistants and great people who help me and the same thing is going to happen in football. It won’t be just me coaching football, it will be me as part of a system of coaches who are all working together and striving for that same goal.